All it took was one genetic mutation more than 600 million years ago. With that random act, a new protein function was born that helped our single-celled ancestor transition into an organized multicellular organism. That's the scenario — done with some molecular time travel — that emerged from basic research in the lab of University of Oregon biochemist Ken Prehoda. The mutation and a change it brought in protein interactions are detailed in a paper published in eLife, an open-access journal launched in 2012 with support of the Howard Hughes Medical Institute, the Max Planck Society and the Wellcome Trust. The research helps to address several important questions that scientists have had about evolution, said Prehoda, a professor in the Department of Chemistry and Biochemistry and director of the UO's Institute of Molecular Biology. It also has implications for studying disease states, such as cancer, in which damaged cells no longer cooperate with other cells in our bodies and revert back to a unicellular state where each is on its own. Mutations can lead to good or bad results, or even to a combination of the two, said Prehoda, whose laboratory primarily focuses on how proteins work inside of cells. "Proteins are the workhorses of our cells, performing a wide variety of tasks such as metabolism," he said. "But how does a protein that performs one task evolve to perform another? And how do complex systems like those that allow cells to work together in an organized way, evolve the many different proteins they require? Our work suggests that new protein functions can evolve with a very small number of mutations. In this case, only one was required." For the research, Prehoda's team began looking at choanoflagellates with the help of Nicole King’s group at the University of California, Berkeley. Choanoflagellates are a group of free-living, single-celled organisms considered to be the closest living relative of animals. These sponge-like, seawater-dwelling organisms have a short, outward-facing squiggly tail called a flagellum that allows them to move and gather food. Choanoflagellates exist both in a single-celled solitary form, but also as multi-cellular colonies. Prehoda and colleagues then used ancestral protein reconstruction, a technique devised at the UO by co-author Joseph W. Thornton, a biologist now at the University of Chicago. By using gene sequencing and computational methods to move backward in the evolutionary tree, researchers can see molecular changes and infer how proteins performed in the deep past. In the new research, gene sequences from more than 40 other organisms were put into play. The team's journey identified a mutation that was important for opening the door to organized multicellular animals that eventually no longer needed their tails. 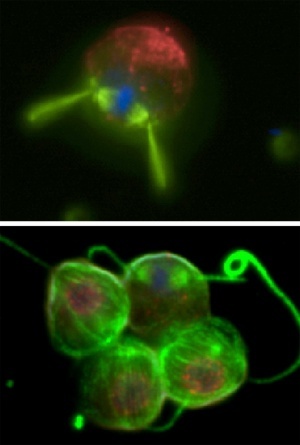 They also found that the choanoflagellate flagellum is critical for organizing its multi-cellular colony, suggesting that this may have also been the case as our single-celled ancestor transitioned to a multi-cellular lifestyle. Prehoda's team suggests that the tail's role became less important when the gene for an enzyme duplicated within cells, and a single mutation allowed one of the copies to help orient and arrange newly made cells. The protein domain that resulted from this mutation is found today in all animal genomes and their close unicellular relatives but absent in other life forms. "This mutation is one small change that dramatically altered the protein’s function, allowing it to perform a completely different task" Prehoda said. "You could say that animals really like these proteins because there are now over 70 of them inside of us." Grants from the National Institutes of Health to Prehoda, Thornton and King, and an early career award from the Howard Hughes Medical Institute to Thornton supported the research. NOTE: The micrograph images shown above were provided by Arielle Woznica, UC Berkeley.